View from the West Stand: GUEST BLOG! After the Lord Mayor’s Show: Where next for the “Group that never gives up”? GUEST BLOG! After the Lord Mayor’s Show: Where next for the “Group that never gives up”? I write this on an overcast Bank Holiday Monday trying, as I suspect most Os fans are, to rationalise how we came so close to promotion again in a play-off final and yet fell short, for the third time in a row, to northern opponents. Was it the West End of Wembley, the fact that the fourth team always seems to win play-offs or the fact that Slade didn’t bring on Robbie Simpson to score a 40-yard screamer in extra time? This time we had real hope, unlike the dismal performance in 1999 or the team that fell short in 2001. Orient went into half-time with a 2-0 lead after a shaky start, but a combination of bad refereeing, Rotherham persistence and a wonder goal from ex-Orient striker Revell pegged the Os back. Despite being the better team in extra-time, tiredness and a lack of cutting edge saw the game go to penalties, where Baudry and Dagnall missed to give promotion to Rotherham and leave us heartbroken. Football is cruel, but in truth this game reflected our season; out ahead, only to be pegged back, then out ahead on penalties, only to be pegged back and miss out. It goes without saying that what Orient have achieved this season is phenomenal. Joint LMA manager of the year Russell Slade has established a solid base of talented footballers that play good, passing football. With the vastly superior budgets of Wolves (and Brentford), it was always going to be hard to sustain an automatic push over 46 gruelling games, but third place was a massive achievement. Nevertheless, the reality is we’ll be playing in League One again next season, travelling to Crewe and Scunthorpe rather than Leeds, Fulham and Middlesbrough. As upset as I am, I’ll still get my season ticket, as I know many other Orient fans will - irrespective of what player or management changes happen in the summer. However, the question remains, where next for these players and this management team that came so close this season and how will Barry Hearn react to yesterday’s events? Barry Hearn sees enough potential in Russell Slade and the key players to increase investment in the management team and playing squad to prevent fragmentation, very much as Brentford pushed on after falling short last season. Key players Moses Odubajo and Dean Cox – even though they are under contract – stay rather than leaving for fees. Out of contract players Lloyd James and Elliot Omozusi decide to stay at the club. Hearn persuades Russell Slade to stay longer term and allows him to add to the squad in several key positions, setting Orient up well for a push on promotion again in the 2014/15 season. Outcome: Orient finish top 6 again or pushing for automatic promotion. 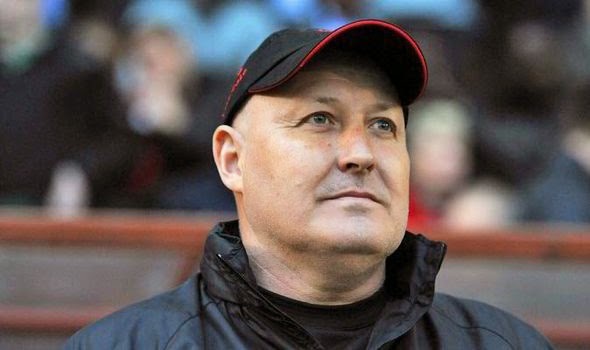 Russell Slade receives an offer from a Championship club and decides to leave. Offers come in for Dean Cox and Moses Odubajo and are accepted, while Elliot Omozusi and Lloyd James decide not to take up new contract offers and leave on free transfers. A new manager needs to come in an entirely rebuild the midfield and get the new team to gel. Hearn stays true to form and invests zero in new players or improving the squad. Outcome: Orient finish lower mid-table or fighting relegation. Russell Slade stays. One of Cox or Odubajo leaves for good money. Orient bring in a winger to replace the departing player. James and Omozusi stay for another year. Most of this squad stays and Orient compete, once again, with a small squad. The team doesn’t replicate this season’s success but still manages a top 10 finish. Tough decisions then need to be made in June 2015. Overall it’s hard to know what to predict will happen after such an emotional day. Most of the key players are under contract, meaning that for them to leave, there will need to be good transfer fees. But this team has been in the shop window all season, meaning a club of Orient’s size will not turn down a £1 million offer if it comes in for Moses Odubajo or a high fee for Dean Cox, both of whom are critical to this team. Much of this also depends on Russell Slade. He was keen to talk to Barnsley when they wanted to discuss the job with him in 2011 and his stock is much higher after this season’s endeavours, which may make him hard to keep. He may also feel he cannot go further with Orient and want a new challenge, after the disappointment of missing out in the play-offs. 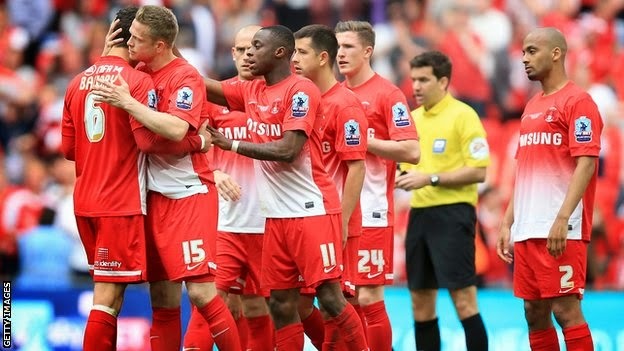 May and June’s movements will tell us much about the chances of this Orient team next season. If this team stays together, there is a chance it could compete again next year. In the background, however, the Olympic Stadium and Barry Hearn’s desire to sell the club still loom large, leaving the long-term future of Orient questionable. Orient fans are hoping the squad will stay together and grow, very much as Brentford have succeeded. But for that to happen, Hearn will need to invest even more, not just in the running of the club, but also in the playing staff, which would require a change in his philosophy or a sustainable club that succeeds on its own merits. Either way, it has been a season to be proud of and I hope another is just around the corner. Up the Os! Some other female likes acquiring duplicate totes. Yet another very good louis vuitton replica issue with regards to these kind of luggage can be that one could quickly discover their whereabouts. These are you can find also along with the most effective way to discover these kind of totes can be on-line. You'll find chanel replica a good amount of internet sites that happen to be giving most up-to-date assortment throughout duplicate totes. Just be sure you purchase a good along with legitimate site pertaining to acquiring duplicate totes. Even though your louis vuitton replica luggage are generally reproductions won't necessarily mean that they may always be involving undesirable good quality as well as undesirable product. Even though making reproductions, good quality can be it is important. Precisely why men and women like these kind of totes can be that this good quality along with rolex replica watches product is actually exactly like the initial versions. Certainly not opt for false luggage while they shall be involving undesirable good quality along with gucci replica handbags will never come up with a long-lasting feeling. In relation to acquiring developer totes, in greatest extent anyone would be able to find the money for only one particular.